Today’s Supreme Court ruling in Arizona v. United States was mostly good news for foes of S.B. 1070, the hard-line immigration law passed by Arizona in 2010, but decidedly bad news for one person who has come out in vigorous support of it: Justice Antonin Scalia. When we last checked in with Justice Scalia during oral arguments for this case, he was in classic form—bellowing, bullying, and bombastic. Thankfully, the majority was a little more level-headed on the subject today. Justice Anthony Kennedy, writing for the majority, offered an elegant and persuasive response to the law’s defenders—including his colleague, who paired his dissenting opinion with a remarkable bench statement that he read out loud this morning in the Court’s chambers. 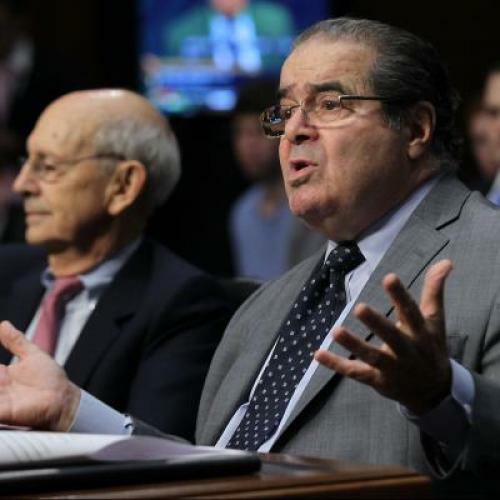 It’s worth reviewing the majority’s opinion before considering Scalia’s response. Overall, the Court accepted the argument of the law’s challengers: Arizona’s law went too far beyond federal law, interfering with federal immigration efforts and taking steps far beyond those Congress has seen fit to take. As Justice Kennedy noted in the majority’s opinion, both the states and the federal government have sovereignty, and “from the existence of two sovereigns follows the possibility that laws can be in conflict or at-cross purposes.” But in those instances, federal law trumps state law. Section 5(C), which made it a misdemeanor for undocumented immigrants to seek work in Arizona, came in for similar criticism. Yes, it’s true that the federal government seeks to deter unlawful employment, but Congress has always chosen to penalize employers, not employees. This isn’t a simple oversight: As Kennedy noted in the opinion, history demonstrates that Congress has found it “inappropriate” to penalize people seeking work, and so Arizona’s law “involves a conflict in the method of enforcement.” Meanwhile, Section 6 allows warrantless arrests when an Arizona law enforcement officer has probable cause to believe that someone has committed a removable offense under U.S. immigration law. This section, the majority wrote, gives state law enforcement officers even greater leeway that federal immigration officers have. This creates a situation wherein Arizona has “its own immigration policy,” and as Kennedy noted, that “is not the system Congress created.” Like its counterparts, Section 6 was struck down. Overall, then, this was a win for the Obama administration—and for the notion that the federal government, not the states, are supreme when it comes to immigration law. But the majority’s opinion did not sit well with Justice Scalia, whose behavior during oral arguments suggested that his view of the case was not limited to constitutional considerations. Of course, Scalia had legal objections to the majority’s reasoning. But he had plenty of FOX News-ready invective, too, declaring in his dissent that Arizona’s residents “feel themselves under siege by large numbers of illegal immigrants who invade their property, strain their social services, and even place their lives in jeopardy.” Federal officials, Scalia claims, “have been unable to remedy the problem, and indeed have recently shown that they are unwilling to do so.” Expect to hear that one circulating in right-wing circles over the next few days. Would the States conceivably have entered into the Union if the Constitution itself contained the Court’s holding? Today’s judgment surely fails that test. At the Constitutional Convention of 1787, the delegates contended with “the jealousy of the states with regard to their sovereignty.” […] Now, imagine a provision—perhaps inserted right after Art. I, §8, cl. 4, the Naturalization Clause—which included among the enumerated powers of Congress “To establish Limitations upon Immigration that will be exclusive and that will be enforced only to the extent the President deems appropriate.” The delegates to the Grand Convention would have rushed to the exits. This isn’t just a jaw-dropping assertion. It’s quite the sleight of hand. The second part of Scalia’s imagined provision—saying that immigration powers “will be enforced only to the extent the President deems appropriate”—refers not the Arizona case, but to last week’s presidential directive concerning DREAM Act immigrants. So it doesn’t even belong in Scalia’s hypothetical scenario, which allegedly concerns the Court’s holding today (rather than, say, everything about immigration that’s been bugging him lately). The president’s directive was not before the Court. So why did Scalia include it at all? To be honest, your answer is as good as mine. Scalia made a cursory effort to link his argument to the Arizona case, but the presence of this digression seems to me entirely political. Scalia’s free to score political points whenever he chooses, but to do so from the Court’s chambers—all while claiming to be the proponent of unbiased, objective originalism—is mendacious in the extreme, and transparent to boot. In that sense, Justice Kennedy’s call in the majority opinion for “searching, thoughtful, rational civic discourse” on the hotly-contested issue of immigration could be read not only as a worthy goal for the country, but as an excessively-gentle admonition of his colleague.